Let's kick off Dungeons & Dragons: Let's Roll Week One- Adventuring for Dummies! Many of the D&D board games are great primers or companions for the Player's Handbook. Dragonfire is basically the closest thing you can get to playing Dungeons & Dragons without role play. Everyone gets very basic versions of characters based on the classic RPG archetypes with relevant statistics - you can familiarize yourself with the feelings of playing lot of classic characters and using their abilities without the pressure of building a character from the ground up and looking at a million numbers on a character sheet. No need for a Dungeon Master! Adventure Cards lay out the stories in a series of scenes with individual set ups and guide you through each scenario. Each turn has 7 phases which is a great prep for rounds of combat in traditional Dungeons and Dragons 5th edition where each player can take a series of three actions during their turn. When you're done with Dragonfire, 3 actions in combat will seem like a piece of cake! In Dragonfire, certain Different damage types prepare you for the strengths of the classes you can choose to play in D&D and certain encounters in Dragonfire require certain damage types to defeat. This can be a key factor for those struggling to choose between a few classes. Learn more about the rules from Becca Scott and "How It's Played." One of the key experiences of Dungeons & Dragons is revealing dungeons, caverns, and keeps bit by bit as you explore - never knowing what might come around the bend! Betrayal at Baldur's Gate by Avalon Hill mimics this experience very well as players slowly reveal the city and its sewer system turn by turn. The game also provides a lot of classic character classes that feature abilities directly out of the Player's Handbook for Dungeons & Dragons 5th Edition. Playing this game will give new players a good entry way to a much loved Dungeons & Dragons location and with less phases and more surprises than Dragonfire, but unlike Dragonfire, it confines you to exploring one city. 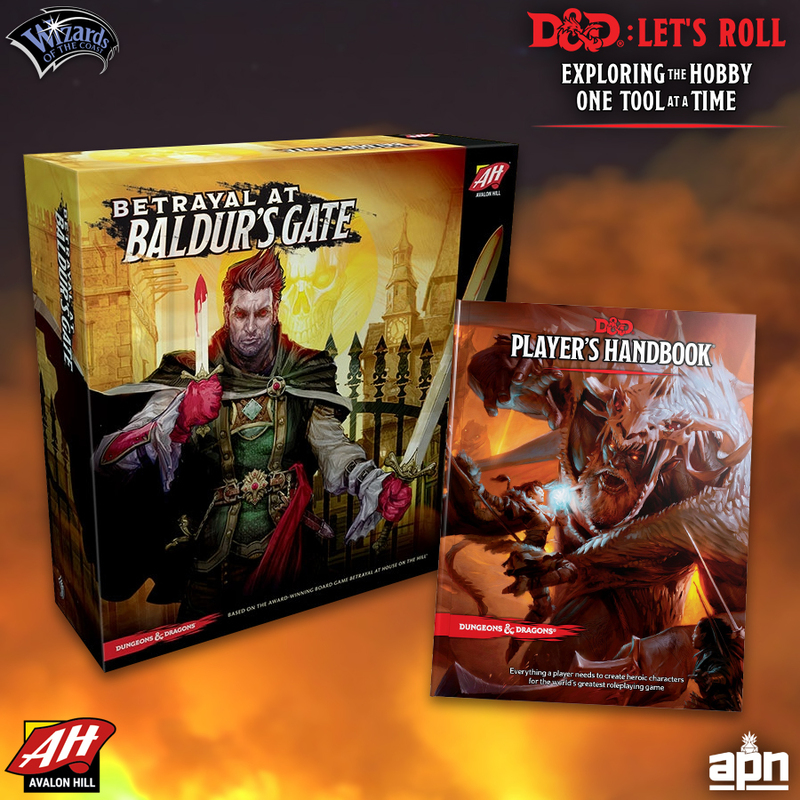 The two games are very different and if you're someone who loves the Betrayal games, you're sure to adore this installment and get to know more about D&D at the time time. For more details on game play, read our feature on Betrayal at Baldur's Gate. I can't tell you how many times I've introduced a new player to D&D, they got excited about playing a magic class, and then their excitement was equalled by their confusion and utter terror when it came to actually choosing and employing spells in combat. 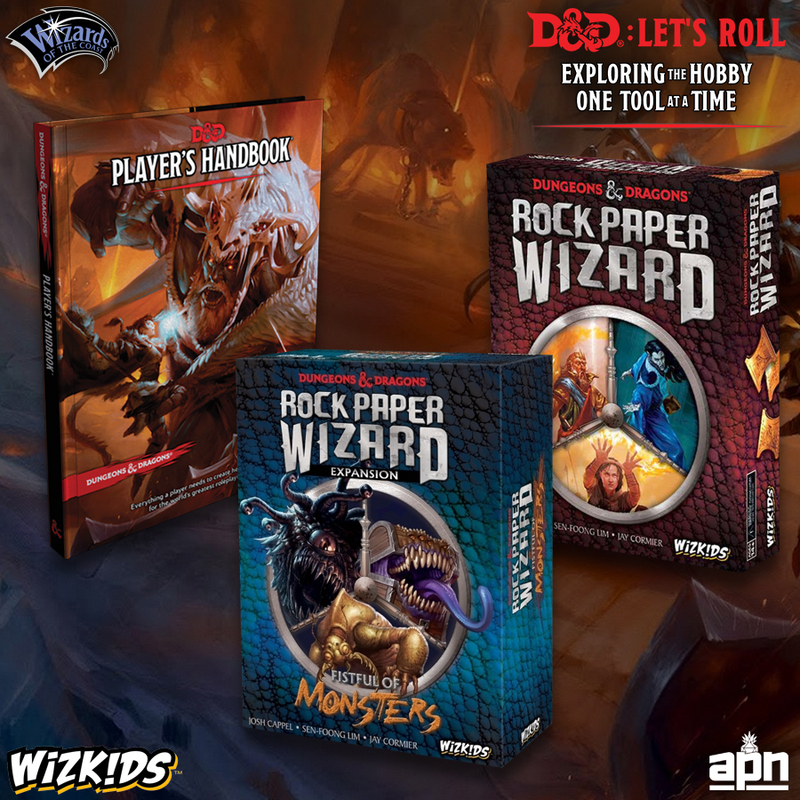 That's where Rock, Paper, Wizard from WizKids comes in! This game, on its own, is a fun, hand signal driven romp that employs various spells from the D&D universe so you can mess with your friends in a board game setting. You'll see spell classics like Color Spray, Chain Lightning, Anti Magic Shield and more. While you'll almost never see a bunch of wizards flinging spells across the table in 5th Edition combat, this is a great way to get to know the kinds of options you might have available to you, so when you roll that Wizard, Sorcerer, Warlock, or Bard, you have a basic idea of the kinds of effects these spells might have. Check out this review from The Dice Tower to learn more about how the game is played. With Gen Con on the horizon, I'm reminded of how important it is to be able to sell your friends on a game by describing it in less than 2 minutes. Justin from Fireside Games can do it for Castle Panic in an impressive 44 seconds! What's your best "In a Nutshell" game description? Let us know in the comments. Have you heard the good word about Lords of Hellas yet? I have been chomping at the bit to get my hands on this treasure by Awaken Realms. My body is so ready for science fiction imbued Greek mythology. Between painting up all of the miniature elements and having the option to play in single player, campaign, and multiplayer modes, there are so many ways to enjoy this game that it's almost overwhelming. There's nothing more nerve wracking to me than the pressure filled moments when I open a new game to set it up for my friends and have to explain the rules before we can get started. If you're like me, the anxiety comes from the fact that I want people to be excited about the gameplay and the art on the table rather than worrying about whether they're "doing it right" or having to halt gameplay constantly for rulings. Between shuffling decks and thumbing through instruction manuals, it's nice to have a chance to learn about the gameplay and victory conditions before I hit the table so that I provide my friends with best - and most fun - experience possible. If I have a working knowledge of how things should function, I can usually present the game in layers, providing rules or demo turns as needed to get everyone up to speed as we go, rather than needing to give an overwrought, yawn-inducing rules lecture at the start. For Lords of Hellas, Board Game Replay had me covered with this great "How to Play" video that walks through how to set up the game, hunt monsters, complete hero quests, build monuments, and battle enemies for region control. With all the rules laid out for me for the multiplayer game, I can shrug off that pressure and get to the fun stuff faster. How do you prep to introduce a new game to your friends? Leave your advice in the comments! Gaming has a million benefits from teaching strategic thinking, to improving brain health, to stress relieve, to encouraging positive social interaction. Often times these positives are balanced by negatives - difficult time management, addiction, competitive rush, cost - it really depends on every player's relationship to the hobby and the individual games they play. This episode of the Greatway Games Podcast takes on both achieving balance in life through gaming as an escape, but also how to balance your emotions at the table and how to read your gaming group to make sure that you are making appropriate choices when selecting the game and playing it with the particular players involved. Check out Greatway Games and show them some love if you enjoyed this discussion. What do you think? Do you take extra precautions to create a healthy table? Are there any measures you pursue to keep you gaming life balanced? Let us know in the comments!